I tried to cater to everyone who wanted more ZE, I really did. However, Zac blog-jacked another post. I’m over you Zac. My entire post with 4 photos and multiple links – gone. I am quitting that man. To top things off, I have a child who is melting down because I checked review of Rise of the Guardians and decided it would be too scary to watch tonight at the discount theater. Where does one even start when recreating a blog post? Mary Poppins Alice in Wonderland would say that the beginning is a very fine place to start. Random note, I just found a lot of really fun Mary Poppins quotes here. So…. back to knitting. I’ve been doing some organizing off and on over the past week. Mostly I’m taking the patterns, books and knitting magazines that I own and entering them into my Ravelry library. That way I can do a search selecting just the patterns I own. I find that I tend to overlook the patterns that I have for something new and shiny. Hopefully this helps. In the last week I’ve finished the 1970’s socks from Socks that Rock in A Very Scummy Christmas colorway. I need to redo the bind off on the first sock and then do the second sock bind off. I used a regular bind off and while they fit, I think I want something stretchier. So I’m going to use the sewn bind off instead. Here’s a picture of how I do it for extra stretch. Pictures of the socks will be coming once they are blocked and dry. I’m anxious for a new pair of socks as it’s been brutally cold here. They actually cancelled school today and tomorrow because of the sub zero temps. It’s a good day for hand knit wool items. Also, a good day to remember that your stash actually acts as insulation for our houses (that’s my stance and I’m sticking to it!). The other items that I haven yet blogged are 2 scarves that I knitted Santa brought for a friend. 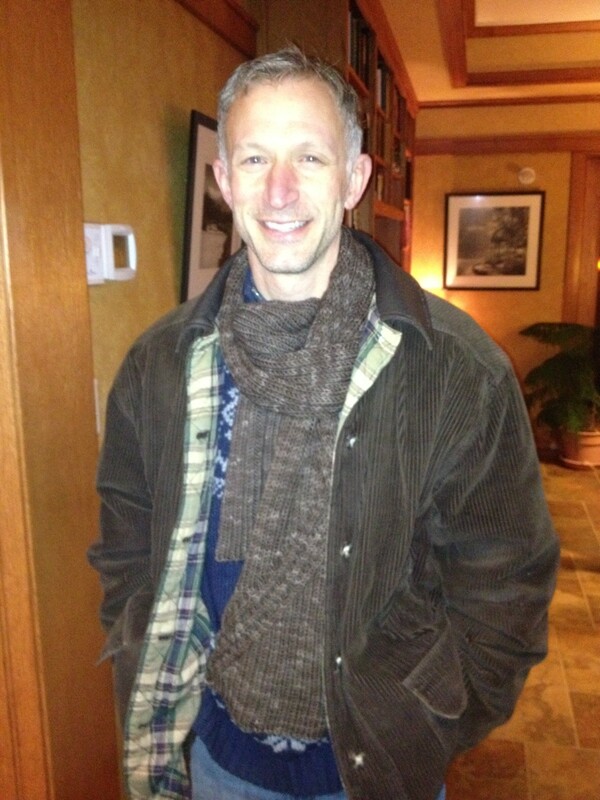 The first (and unphotographed) is a Staggered Rib Scarf similar to the one I knit for my boss last year. I knit this one out of some Lion Brand chunky that had been in my stash for years upon years. The skein was a little short on yardage so I made 2 button holes three rows before I bound off. The girls and I found some cool grey buttons to sew on. I guess the recipient has gotten a lot of compliments on his unusual scarf. The second scarf is the Autobahn Scarf. I’m a little frustrated with this pattern. Maybe I’m missing the boat here, but I bought the pattern from Twist Collective. It didn’t sync to my Ravelry Library and there doesn’t seem to be a way to access the errata without buying the pattern all over again. The problem I found was that I could get the cables to go one direction, but when they switched direction the cables on the back side didn’t work out right. I finally just gave up, ripped it back a bit and decided to let the ribbing continue up the rest of the scarf instead of cabling it all. The yarn I used, Socks that Rock in Heavyweight was awesome as usual. Since the recipient claims that he is not very “metro,” I used a nice manly brown. The cables are classic enough that I think anyone could wear this scarf. They tried to get me to take them to that movie too and I thought it was too scary looking! Brrrrr….. good thing you have all that “insulation”! I love how your scarf turned out for your not very “metro” friend. That’s funny about the Twist not syncing right. I just synced mine recently…. maybe I should check my patterns too. Ah. I know what you mean. 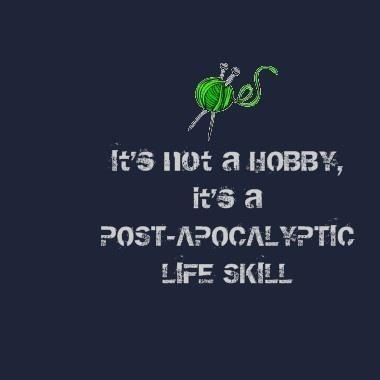 I’m totally trying to knit from my yarn & pattern stash this year. There’s a lot of great patterns in my IKs that I forget I have until I run across the magazines in their random piles. Most of my stuff is in my library, but I could still do better. Have you tried Jeny’s Suprisingly Stretchy Bind Off instead of the sewn bind off? Just learned that one and really love it.